- These Beakers are moulded in Polypropylene, have excellent clarity and very good chemical resistance. - These autoclavable beakers have prominently raised graduations on the outer surface. - Pouring a solution becomes very convenient because of its tapered spout. Polylab Beakers, moulded in Polypropylene, have excellent clarity and very good chemical raised graduations on the outer Surface. Pouring a solution becomes very convenient because of its tapered spout. Available Different Sizes: 50, 100, 250, 500, 1000, 2000ml. Polylab Beakers, moulded in Polypropylene, have excellent clarity and very good chemical resistance. These autoclavable Beakers have prominently raised grtaduations on the outer surface. Pouring a solutions becomers very convenient because of its tapered spout. 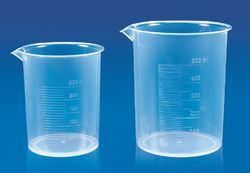 We have in store for our customers Beakers, which are moulded in polypropylene and have excellent clarity and very good chemical resistance. These autoclavable beakers have prominently raised graduations on the outer surface, which makes them non-breakable even at high temperatures and under other extreme conditions. Radical Beakers, moulded in Polypropylene, have excellent clarity and very good chemical resistance. These autoclavable Beakers have prominently raised graduations on the outer surface. Pouring a Solution becomes very convenient because of its tapered spout. Polylab Beakers, moulded in Polypropylene, have excellent clarity and very good chemical raised graduations on the outer Surface. Pouring a solution becomes very convenient because of its tapered spout. Available Different Sizes: 50, 100, 250, 500, 1000, 2000ml. Glass agencies are manufacturer of beaker polypropylene graduated. Beakers, moulded in polypropylene, have excellent clarity and very good chemical resistance. These autoclavable Beakers have prominently raised graduations on the outer surface. Pouring a solutions becomes very convenient because of its tapered spout. 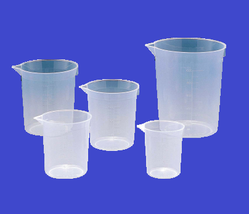 Beakers, moulded in Polypropylene, have excellent clarity and very good chemical resistance. These autoclavable Beakers have prominently raised graduations on the outer surface. For better understanding of volume and its conversion concept, a maths lab required a set of Jug & Beaker. These durable polypropylene set come in calibrations of 50, 100, 250, 500 and 1000 milliliters for volume experiments.